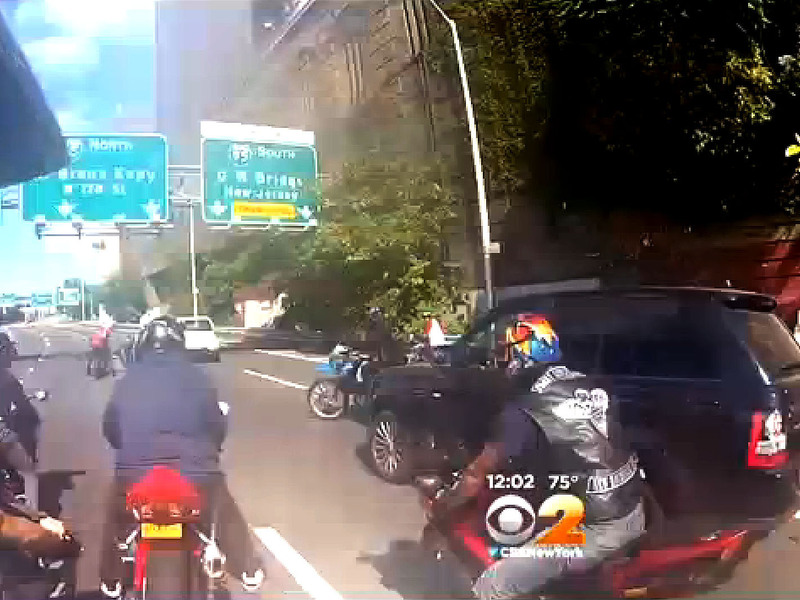 (CBS) NEW YORK - Authorities have released a suspect who was arrested in connection with the assault of a man by a group of bikers while he was driving with his family on a New York City highway, reports CBS New York. A second suspect remains in custody and is scheduled to appear in court Wednesday, according to the station. The Manhattan District Attorney's Office has declined to prosecute Allen Edwards, 42, who was charged with reckless endangerment, criminal mischief and menacing after he surrendered to police on Tuesday. A second suspect, Christopher Cruz, 28, was arrested and charged with reckless endangerment, reckless driving, endangering the welfare of a child and menacing. He is due in court Wednesday. Authorities have said they are still looking to make more arrests as they continue to piece together the chain of events that led to the confrontation, which was caught on a camera mounted on the helmet of a fellow biker and posted to YouTube. The video shows a large group of bikers driving around a Range Rover that was heading north on the Henry Hudson Parkway on Sunday. One of the bikers, who police later identified as Cruz, is seen driving alongside the SUV, peering into the driver's side window. In the video, the biker then cuts in front of the Range Rover and suddenly slows down, causing a collision. Police said Cruz intentionally brake-checked the SUV, reports CBS New York. After the collision, the bikers, 20 to 30 in all, are seen surrounding the Range Rover that was being driven by Alexian Lien, 33. His wife and their 2-year-old daughter were also inside the car. That was when police said some of the bikers began damaging the Range Rover, though it's not clear from the video. "They take their helmets and they start to dent his car and apparently his tires are slashed there," Police Commissioner Ray Kelly said. Lien then hits the gas, plowing his way out and running over biker Edwin Mieses Jr. The bikers then chase after the Range Rover for about two miles, reports the station. At one point in the video, the SUV stops and one of the bikers is seen ripping open the driver's side door as the Range Rover speeds off. The SUV eventually gets off the highway around West 178th Street and St. Nicholas Avenue, police said. As Lien gets stuck in traffic, the bikers surround him again, police said. One of the riders is seen in the video jumping off his bike, ripping off his helmet and using it to bash in the driver's side window. A second biker, who police believe to be Edwards, is seen running up and hitting the driver's side rear window with his fists. At that point, the video ends but Kelly said Lien is pulled out of his car and assaulted, reports the station. Lien was taken to the hospital where he needed stitches to his face. His wife and child were unhurt. Mieses suffered broken legs and spinal injuries when he got off of his bike to help another rider, his wife Dayana Mieses said Tuesday. She told CBS Boston he is paralyzed and that Lien should face criminal charges. The bikers were part of a group called Hollywood Stuntz who were in the city as part of unauthorized ride to Times Square, police said. Kelly said Tuesday that a total of 200 people complained to police Sunday that the bikers were being reckless on city streets, reports the station. In order to prevent the group from heading into Times Square this year, police set up checkpoints throughout the city. Kelly said during that effort, 15 arrests were made, 68 summonses were issued, and 55 motorcycles were confiscated.